Looking for the ideal present for the beer lover in your life? Or maybe the beer lover in your life is you, and you want a simple, satisfying answer to that annual question from spouse/parent/child: “What do you want for Christmas this year, then, you awkward old get?” The Zythophile blog has the perfect answer: Amber Gold and Black, the history of Britain’s great beer styles, the first and only book to cover the story of every type of British beer from IPA to stout, from mild to porter. For Americans it’s available via here, if you’re in the UK you can get it here, and if you don’t want to use Amazon you can buy it from Beer Inn Print here. Amber Gold and Black shows the routes each British beer type took as they evolved into the beers we know today, and details some of the top examples in each style. If you want to know just how the pint in your hand came to be the way it is, whatever it’s a pint of, Amber Gold and Black is the book to tell you. The book reveals, among other fascinating stories, how bitter, regarded around the world today as the typical British working man’s pint, was born as a drink for snobs in the early years of Queen Victoria; how mild, the biggest-selling beer style in the country when the Beatles released their first LP, was originally strong and pale rather than weak and dark; how porter, the British beer style that once swept the world, owes its success to the 18th century equivalent of a Ferrari-driving City smoothie; how stout became “good for you“; how India Pale Ale was a lucky accident that came about because of the greed of several dozen ships’ captains; how Britain lost its wheat beer tradition because James II lost his throne; and how a weed that infests thousands of British lawns was once just one of dozens of herbal flavourings in British ales. It looks at the important role British brewers played in helping two young men from Munich and Vienna develop modern lager; it charts the invention and rise of golden ale and wood-aged beers, two of Britain’s newest beer styles; and it details long-vanished British beers such as broom ale, mum and West Country white ale. Your book rocks. Read it once, hugely entertaining and informative, so much so that it’s on my list of books to go on holiday with next week. You can find out if it really does rock by buying Amber Gold and Black yourself for just £9.99 plus p&p via this link if you’re in the UK or Europe, or for $16.47 from here if you’re in the Americas. Should you not like Amazon, you can also order it from my mate Paul Travis at Beer Inn Print here. 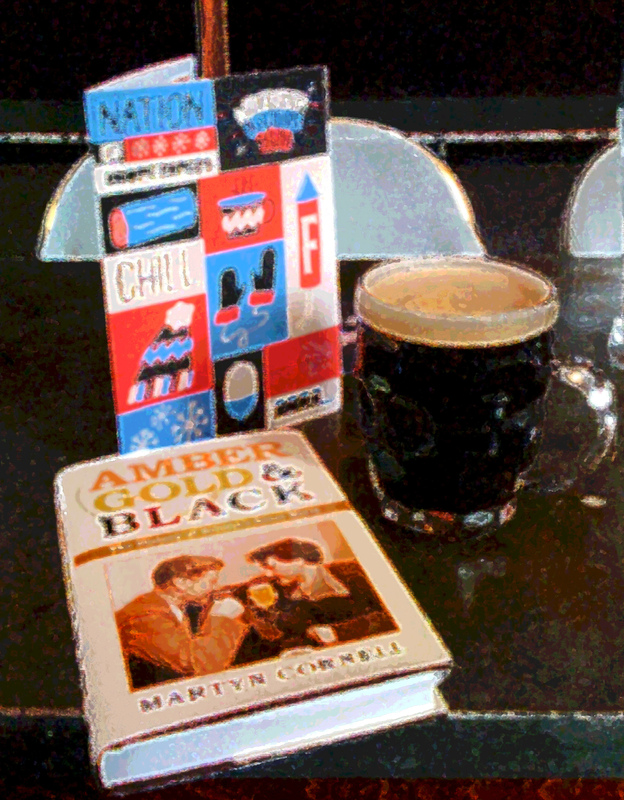 If you’re resident in the US or Canada and you’ve thought about buying a copy of my new book Amber Gold and Black, the British beer styles bible, but you’ve been put off by the cost of shipping it from the UK, good news – my publisher tells me the book will be available in North America from June, and details will be going up on Amazon.com “within the month”. “Britain is one of the world’s greatest brewing nations: a fact the British themselves often seem to be unaware of. We need to be much more proud of what we have given ourselves and the world: beautiful, refreshing hoppy bitters and IPAs, golden summer ales for hot days in the garden, heady, rich barley wines, unctuous winter warmers, cheering, sociable, conversation-encouraging milds, creamy, reviving black porters and hearty, filling stouts, barley wines and old ales for sipping and relaxing, beers that go with food of all sorts and beers that can be enjoyed on their own, beer styles born in these islands and now appreciated and brewed from San Francisco to Singapore, and St Petersburg to Sydney. “This book is a celebration of the depths of British beer, a look at the roots of the styles we enjoy today, as well as those ales and beers we have lost, a study into how the liquids that fill our beer glasses, amber gold and black, developed over the years and a look forward to some of the new styles of beer being developed in Britain in the 21st century, such as ales aged in casks that once contained whisky or rum. “Astonishingly, despite a greatly increased interest in beer as a subject in Britain over the past 30 or so years, this is the first book devoted solely to looking at the unique history of the different styles of beer produced in Britain, more world-conquering styles, it might be suggested, than any other nation has managed. “It may be a good thing that Britons would rather be down the pub enjoying their beer with friends than sitting on their own at home reading about it. But I hope that learning more about, for example, how bitter grew and developed out of the Victorian middle classes’ desire for the then newly fashionable pale ales once exclusively enjoyed by the gentry, how the demand by the street and river porters of London for a filling, strength-giving beer to help them get through the working day eventually gave us a style that, in Irish arms, circled the globe, how a style developed for Baltic aristocrats became Burton Ale, one of the most popular beers in Britain until a couple of generations ago and now almost forgotten; how beers such as broom ale, mum and West Country white ale once thrived and then vanished, how the huge boom in brewery numbers in Britain in the past 30 years, with more than 500 microbreweries now in operation, has helped bring in new styles such as golden ale and wood-aged beers; and even how 19th century British brewers helped inspire the development of modern lager, all may add to the enjoyment of your beer-drinking, wherever you are doing it, and encourage you to appreciate the marvellous drink, beer, more, and to explore further its many offerings. “In addition, detailing the long histories behind Britain’s beers may go some way to restoring respect for the country’s national drink. While Thomas Hardy could write in his novel The Trumpet Major of Dorchester beer that: “The masses worshipped it; the minor gentry loved it more than wine, and by the most illustrious county families it was not despised,” today beer is seldom given the position at the heart of British gastronomic life that it deserves. British food grew and developed alongside beer, and the two complement each other, just as French or Italian food is complemented by wine. Roast beef is fantastic with pale ale, porter is terrific with steak or lamb, stout is great with pork and chicken, or spicy foods, and any British cheese has its companion beer, from Cheddar and bitter to Stilton and barley wine – and desserts go just as well with beer too, as anyone who has tried apricot clafoutis with IPA, strong ale with plum pudding or chocolate stout with good vanilla ice-cream will affirm. 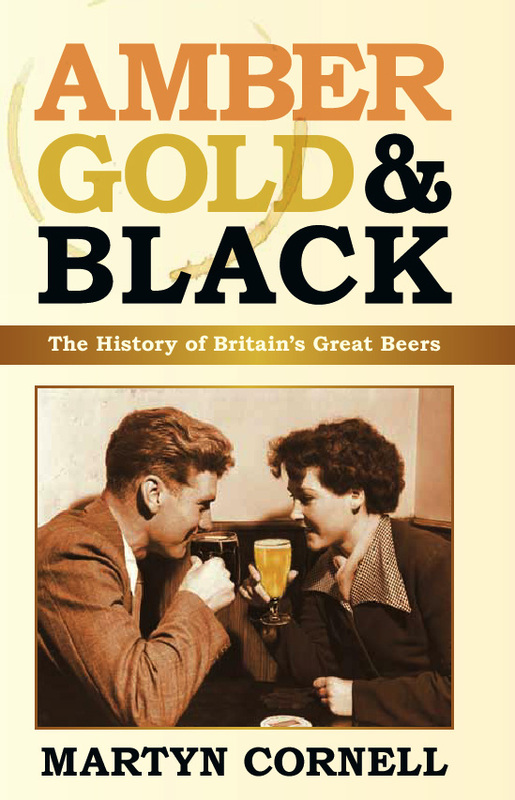 It’s now less than one month to go to the official publication of Amber, Gold and Black, The History of Britain’s Great Beers, the first book devoted solely to the development of beer styles in Britain, from bitter to porter, covering every aspect of their history, what they were when they started , how they developed and what they are today. Pre-order it today here and put a few pennies more in my pocket at the same time that you learn new facts to stun your beer drinking friends. Amber, Gold and Black was previously only available as an ebook, but is now, thanks to the lovely people at The History Press, coming out in hardback, revised and, where needed, updated. Whether you’re a beer beginner or a buff, I guarantee you’ll learn things you never knew about both beers you’re familiar with, and beers you’ve never heard of. This is the book for beer lovers, for brewers, for people who work in pubs, bars and drink stores, for anybody interested in beer, the most complete and comprehensive study of British beer styles ever written. Its 16 chapters looking at the roots of the styles we enjoy today, as well as those ales and beers we have lost, and a study into how the liquids that fill our beer glasses, amber gold and black, developed over the years.